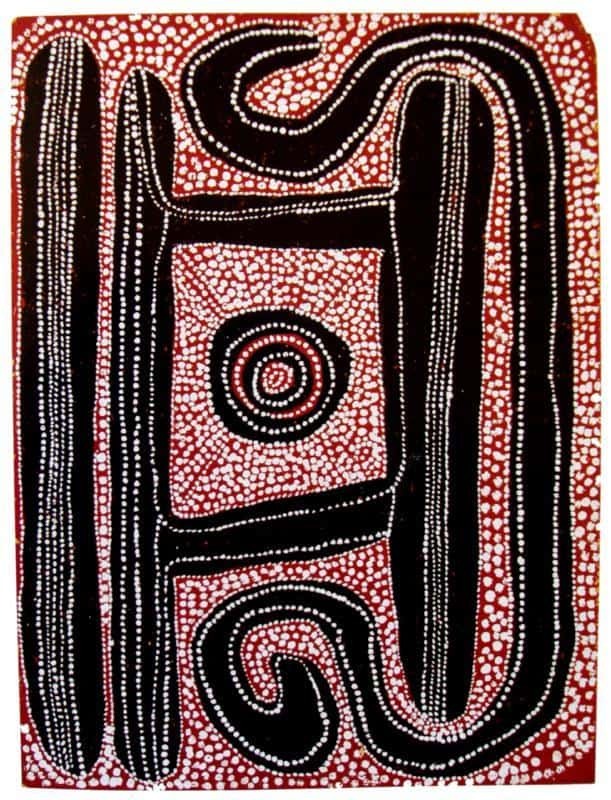 The aim of this article is to assist readers in identifying if their Aboriginal painting is by Wuta Wuta Tjangala. It compares examples of his work. 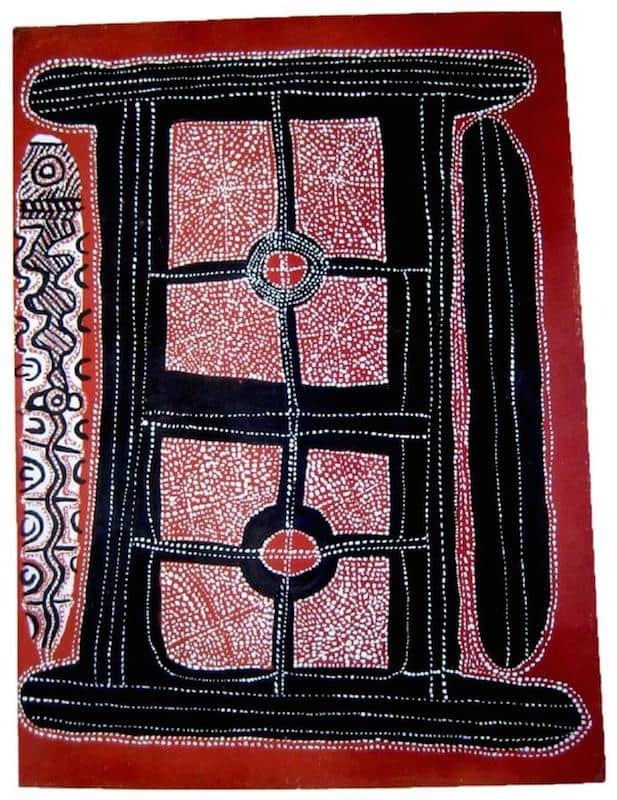 If you have a Wuta Wuta Tjangala Aboriginal painting to sell please contact me. If you want to know what your Wuta Wuta Tjangala painting is worth please feel free to send me a Jpeg. I would love to see it. 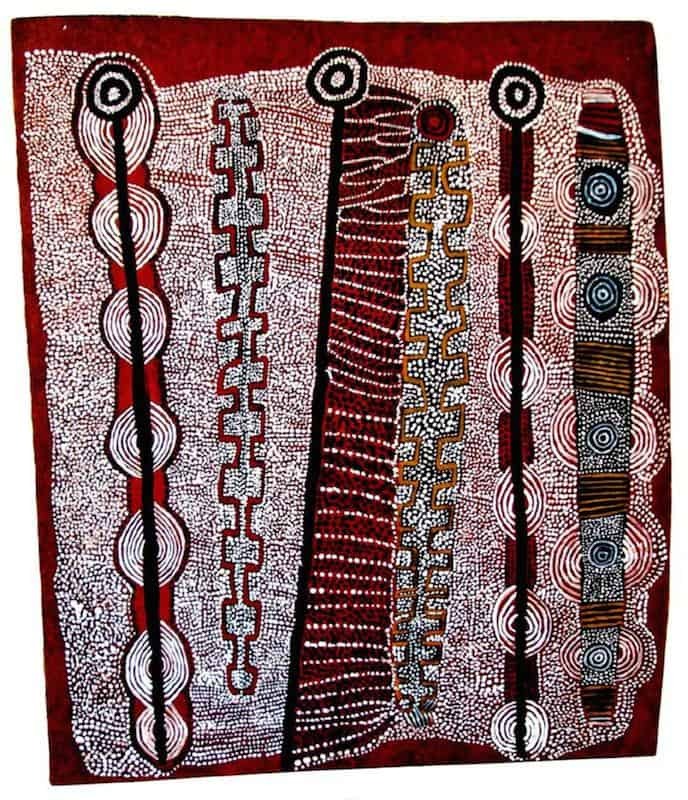 Wuta Wuta Tjangala was born around 1926 in Western Australia in Drovers Hills. He made an epic journey to Haasts Bluff with his family during the severe drought of late 1950’s in the company of Charlie Tarawa. Two years later he returning to his homelands. In 1957 Wuta Wuta moved back to Haasts Bluff with Timmy Payungka and his wife and child. He settled in Papunya in the late 60’s and became the primary school’s gardener along with Antijari and Long Jack. 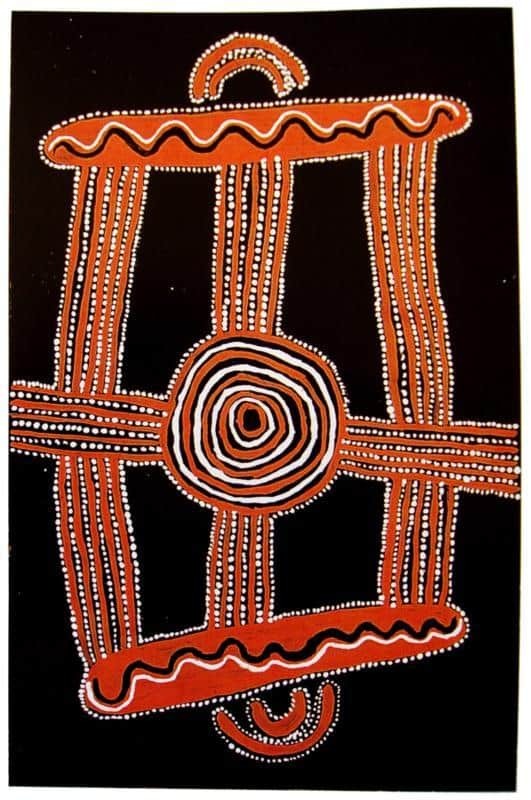 In 1971 Geoff Bardon a local school teacher encouraged aboriginal people to paint and record their traditional stories. 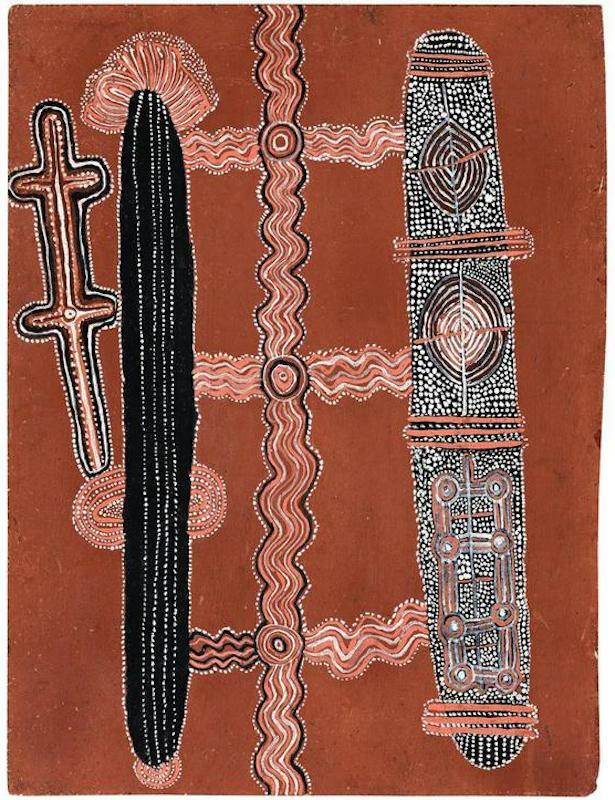 When supplying paints to Wuta Wuta Tjangala and his friends, Bardon suggested the men use their existing cultural symbols and depict their Dreamings and links to the land. Wuta Wuta’s painting career and reputation began at this time. He was a founding member of a men’s painting group. Being a senior Pintupi tribesmen he and Charlie soon inspired other Pintupi tribesmen like Shorty Lungkarta and Yala Yalato join them. The Pintupi men painted under a bough shelter behind the camp. They painted using traditional sacred images while chanting the song cycles that told the stories. Wuta Wuta Tjangala’s earliest works generally featured major story elements with only the barest dotted in-fill within the iconography and small sections of the background. Paintings with clean unadorned background are more popular with collectors. They feel stronger and more powerful. The rather crude dotting and line work of these early paintings on board give them an energy and power that is less apparent in his later more technically proficient works. Early works aroused strong protest within other Aboriginal communities when first exhibited in Alice Springs in 1974. Other aboriginal groups felt the paintings disclosed to many secrets and much sacred knowledge. A period of experimentation followed. One solution was for areas to be covered in the characteristic dots of aboriginal art. These dots covered areas and veil sacred elements from the uninitiated. 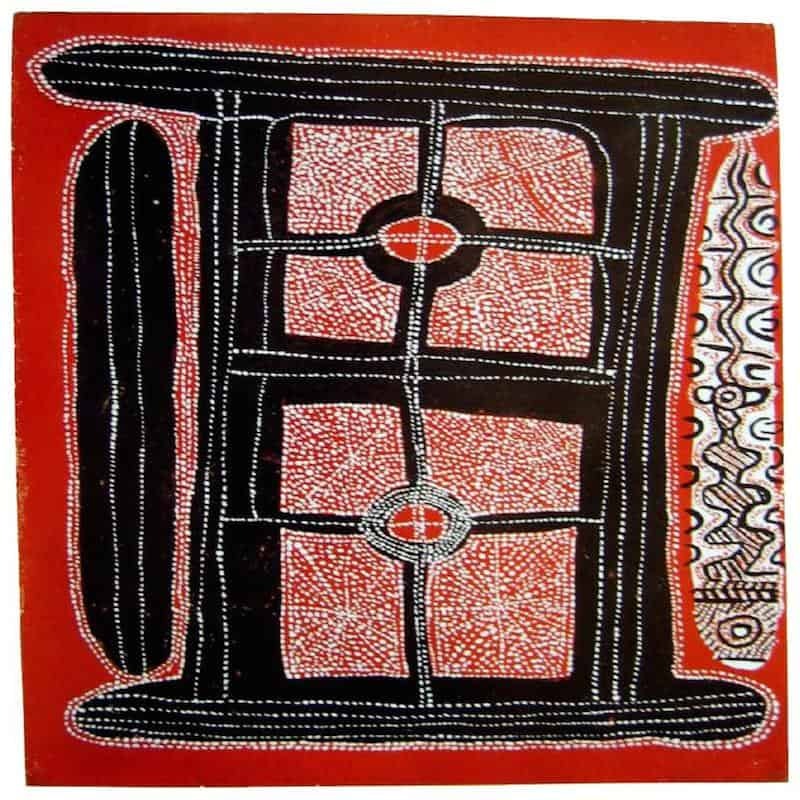 Wuta Wuta Tjangala was influential in helping the painting group break through cultural constraints. Wuta Wuta was highly respected and had an exciting and charismatic personality. This along with a bold and dynamic painting style played a vital role in these developments. The aesthetic balance and harmony of these works are derived through color and weight rather than by a geometric division of the painted surface. Despite the popularity of his earliest works, I think Wuta Wuta flourishes in this middle period. 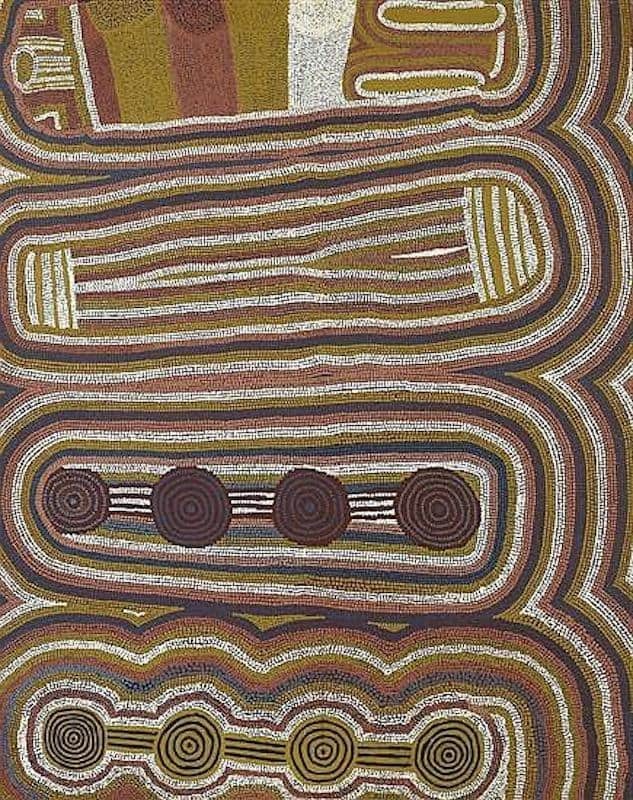 In the early 1980’s, Wuta Wuta Tjangala completed what was to become one of the most important and revered works of the entire Western Desert art movement. He painted Yumari 1981, his largest and most significant painting. Yumari reveals the mythical Tingari ancestors traveling across vast stretches of country as they create sites and institute rituals. Yumari is a rocky outcrop in his home country and the key ceremonial site of the area. Story elements and natural features blend seamlessly into a beautifully balanced geometry of concentric circles and connecting lines that enclose a central, abstracted figure. 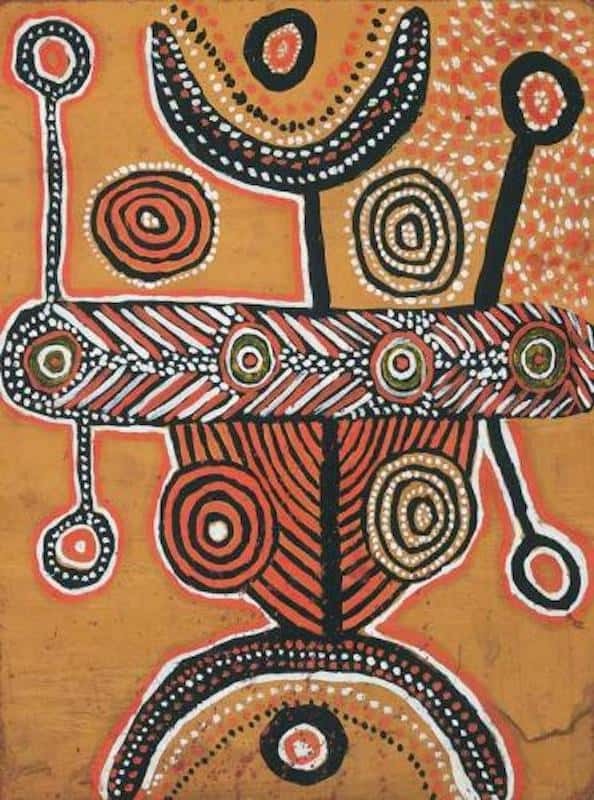 Yumari was exhibited at the XVIII Bienal de Sao Paulo in 1983 and is now in the collection of the National Museum of Australia. Wuta Wuta developed a style that censored the more secret and sacred content in his painting, He added more dot-work as the years went by. He painted more Tingari sites completely surrounded by neat dots. the sites themselves became less and less detailed. While painting Yumari, important discussions were taking place at Papunya. Many aboriginals were thinking of moving back to the Pintupi homelands at Kintore. Land rights legislation during the 1970’s returned ownership of the land to its traditional owners. Uta Uta was a strong advocate for resettlement. Wuta Wuta Tjangala was to be amongst the first to resettle in his homelands. He set himself up with his family on a small outstation west of Kintore. Many of Wuta Wuta offspring and immediate family became artists. They included his wife Walangkura Napanangka and their five children including Shorty Jackson. 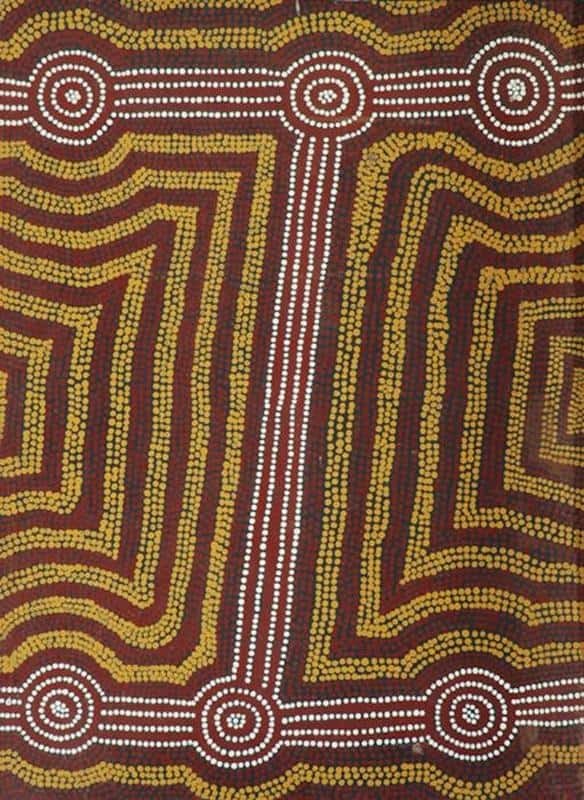 Wuta Wuta Tjangala died in 1990 but his art continues as a strong influence on Western Desert art. Tjangala his skin name varies in spelling and his name can be Wuta Wuta Tjungala,Wuta Wuta Djangala or Wuta Wuta jangala. The following images are not the complete known work by this artist but give a good idea of his style and range.